In my article last week, I offered thoughts on where consumer tech, media and advertising were likely to intersect at CES 2016 and predicted the car would take the spotlight at CES 2016 as the ultimate piece of mobile technology. It did. For the first time at CES, "driverless" cars took center stage. Most, if not all, of the carmakers at CES outlined specific commitments to research, pilot programs or full-on product development around driverless cars. Ford even went so far as to detail its vision for the future of transportation, complete with a prototype of a folding electronic-assist bicycle that fits in the trunk of a 2016 Ford Focus. There’s good news for advertisers in the near-term as well: Carmakers also featured in-car connectivity and on-board tech capabilities with significantly more integration to existing content and app ecosystems this year. We saw significant integration with Apple’s CarPlay — a huge upgrade this year for the consumers who want to bring their own content along with them in their cars. CarPlay integration enables drivers to stream content via their chosen streaming service (such as Spotify) using the vehicle’s onboard entertainment system. This is good news for advertisers: as those services become ubiquitous across carmakers, extending the reach of a campaign into cars becomes simpler — a huge benefit in a landscape of ad tech complexity. A massive watch-out on this will be security and the carmakers ability to make consumers comfortable that they’ve made everything in the circuitry of a driverless car 100% bulletproof to avoid the perceived risk of a driverless car being hacked while speeding down the highway. What’s next in wearables … headphones? It was somewhat surprising that in a category filled with new technologies, much of the buzz in wearables this year was around...headphones, which are poised for major disruption in the next couple of years. To date, wireless Bluetooth headphones have been plagued with problems around battery life, range, sound quality — not to mention the fact that they are expensive. This year, a crop of new offerings with improved battery life, better range and small, lightweight form-factors were revealed. Welcome news for people who need a steady stream of audio flowing into their ears, or who spend a lot of time on the phone while on the go ... and advertisers will enjoy better access to those audiences as a result. Once relegated to the lot outside the Las Vegas Convention Center, drone manufacturers — and the ecosystem of businesses that has sprung up around them — now occupy significant floor space in the South Hall. We saw several drone demonstration "cages" where drones of all sizes hovered and streamed live video via on-board cameras, some in 4K. 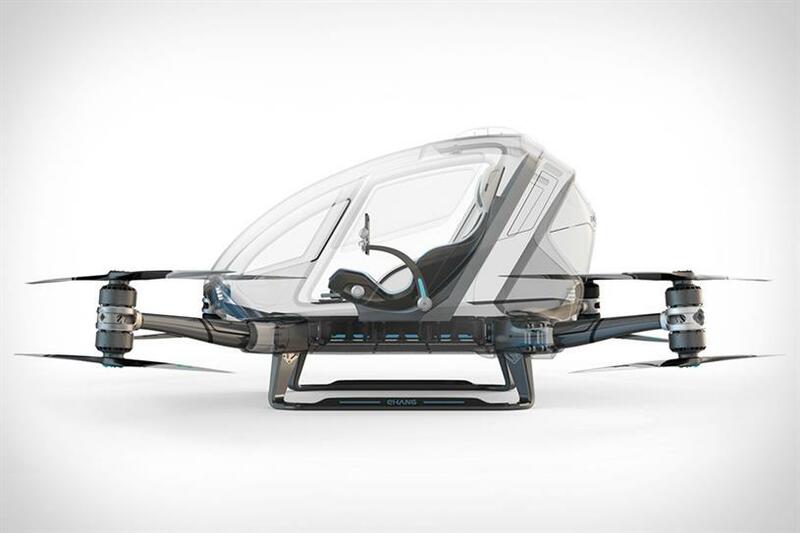 A company called EHang displayed one that can supposedly carry a person weighing up to 220 pounds. With the rapidly expanding drone ecosystem comes a variety of interesting brand-able opportunities: drone racing and drone battles can be sponsored, drones hovering around stadiums or racetracks can carry branding and a few previously un-observable events could be more easily captured (i.e. mountain ascents). Major regulatory hurdles remain—but definitely an area worth watching. I expected to see products that will accelerate consumers’ decisions to "cut the cord" on their cable service — and to some degree I did (a new crop of over-the-air DVRs, Google’s announcement of new hardware partners for Android TV). However, one of the more compelling offerings was a cord keeper. Dish, the satellite TV provider, featured its newest DVR, the Hopper 3, which is launching later this year. It features an astounding 16 tuners and a 2-terabyte hard drive, enabling content hounds to DVR 500 hours of HD content. Of course, the ability to record 16 different shows at once enables a new level of time-delayed, and potentially commercial-skipped programming, and that has massive implications for advertisers. With the introduction of such a powerful set-top box, Dish is asking would-be cord cutters to think twice — which may end up being good news for advertisers. CES 2016 was more about evolution than revolution … less about new technologies and more about the rapid development and adoption of nascent ones. For advertisers there will be more complexity and opportunity. In a world of driverless cars and drone transport, the ability to become part of the consumer journey is greater than ever before. Jason Harrison is the global CEO of Gain Theory. Tim Armstrong: "Pay attention to the human operating system"